Live updates from match No 50 of the Indian Premier League between Mumbai Indians and Kings XI Punjab. Preview: Hosts Mumbai Indians will fancy beating a floundering Kings XI Punjab when both sides face off in a must-win match in the Indian Premier League in Mumbai on Wednesday. If there was a team you could have picked for the final match, it would have been Delhi. Mumbai have it in their hands now. RCB could also get in the mix but they are facing SRH next. A win there would get them to 12 points as well. That would leave us with 4 teams on 12 points! 00:12: MI have won a thriller. They have beaten KXIP by 3 runs. 3 balls needed, McCleanghan bowls a full toss. Axar slams that into the stands for six. The second last ball was a superb bouncer. Axar didn’t know anything about it. 1 ball, 8 runs to win and that is pretty much impossible. Manoj got a four but MI have won and McCleanghan is doing push-ups! In the dugout, KL Rahul looks distraught. WICKET! Yuvraj falls. Caught in the deep. Just didn’t look convincing. 15 runs needed from 3 balls now. Bumrah’s spell comes to an end with another brilliant over. Tye was superb for KXIP, Bumrah... the same for MI. 4-0-15-3. What a spell. Can MI win this? Can KXIP steal one? McClenaghan for the last over. Kings XI Punjab require another 17 runs with 6 wickets and 6 balls remaining. WICKET! Bumrah for the penultimate over and he does it. His slower ball gets Rahul, the crowd goes wild. Rahul hit it straight to the man in the deep. Time for Yuvi to win this? Cutting got his first over of the evening and he managed to do a pretty decent job for the first two balls. Then, he bowled a short ball and Rahul hooked it for four. Then, a reverse hit for four off a leg-cutter. Same treatment off the next ball. Rahul got a single off the last ball to keep the strike. Kings XI Punjab require another 23 runs with 12 balls remaining. Kings XI Punjab require another 38 runs with 7 wickets and 18 balls remaining. WICKET! Brilliant short ball from Bumrah does the trick. Stoinis was surprised and gloved it to the keeper. Well directed. Axar sent ahead of Yuvraj! This is insane. WICKET! Finch had no option now. He had to go for it. But this went up a mile – the batsmen almost completed two runs before Hardik caught it well. Stoinis sent up ahead of Yuvraj! KXIP going for it now. The last two balls of the Markande over were sixes. The first one was flat and straight. The second was into the second tier. Huge. Kings XI Punjab require another 42 runs with 9 wickets and 24 balls remaining. Hardik’s four overs are done. 42 runs off it but the last over was a good one given the circumstances. Just 6 overs despite two wides being bowled. Someone in KXIP needs to go (ideally Finch) for the big shotd now. They can’t leave it too late. Kings XI Punjab require another 66 runs with 9 wickets and 36 balls remaining. Another 10 run over. KXIP doing just enough, they haven’t ever really gone crazy tonight. Just incredibly smart so far. One big hit almost every over and a lot of singles and twos. Is this when KXIP start making their move? McClenaghan and Bumrah operating in tandem. MI need a wicket but if KXIP can take these two for runs, they will be in a good space. 12 runs from the over. Good over from Bumrah. Just four runs off it. But interesting data shown on the TV screens. His release point in IPL 2018 is much wider than it was in 2017. The change that trying to bowl the Test match line has made. Fifty for Rahul – just 36 balls. What a vital innings for KXIP, Rahul’s 10th IPL fifty but six of those have come this year. 92 runs off 54 balls – that is the equation at the moment. Bumrah into the attack next. Rahul, meanwhile, has gone past 600 runs this season. First batsman to do that this season. Good over by Hardik though, just six runs off it. We are at the halfway mark and it still is a pretty close game. Remember MI have three Bumrah overs in hand. Will that be the key? KXIP need 101 off 60 balls to win. Rahul and Finch are playing the smart game here. Lots of singles and the odd four. A partnership is being built. With wickets in hand, MI bowlers will start to feel the pressure. Rohit, though, has clearly saved Bumrah for the end. The paceman bowled one brilliant over first up and was then taken out of the attack. But should Rohit be looking to break this stand? Sunil Gavaskar clearly loves KL Rahul. Once again, the first ball was hit for four. Lovely batting this. It just takes the pressure off the batsmen for the rest of the over. 9 runs from the Markande over. The first ball was cut away for four but the leg-spinner kept things down to singles after that. A four off the first ball, a drop off the second. Wonderful effort by Cutting, he timed his jump right but just couldn’t hold on to the high chance at cover. Rahul was on 21 – how will that hurt MI? 11 runs from the over. A pretty decent Powerplay too. Finch and Rahul need to get a partnership going. And the indications are that it might be happening. The Australian launched the last ball into the stands. Finch doesn’t have any obvious weaknesses like Gayle, MI bowlers will have a more difficult time targeting him. WICKET! The short ball does the trick. McClenaghan gets him. The big Jamaican is clearly troubled by the short ball. It went miles high but Cutting took it well. But this change of ends business is strange from MI. Should Bumrah have got another over? Should McClenaghan continued from the other end? Should Hardik have been given that over? McClenaghan had a pretty decent first over but MI decided they needed to change things up and go with Hardik instead. The first ball went for six, the second was edged for four. Another outside edge, this time off Rahul’s bat, sped away for four in the third man region. And to cap it off, Rahul unleashed a majestic cover drive. 19 runs off the over. KXIP are up and away. Bumrah with a brilliant over to start things off from this end. It had everything – bouncers, pace, slower balls. This was good bowling. Just one run from the over. Should KXIP just play out Bumrah? The edges do fly at the Wankhede and one of them gave Rahul his first six of the innings. McCleanghan was good for the rest of it. Still early days but MI need to break this stand early, we have already seen how dangerous it can be. KXIP innings about to begin. Rahul and Gayle in the middle. 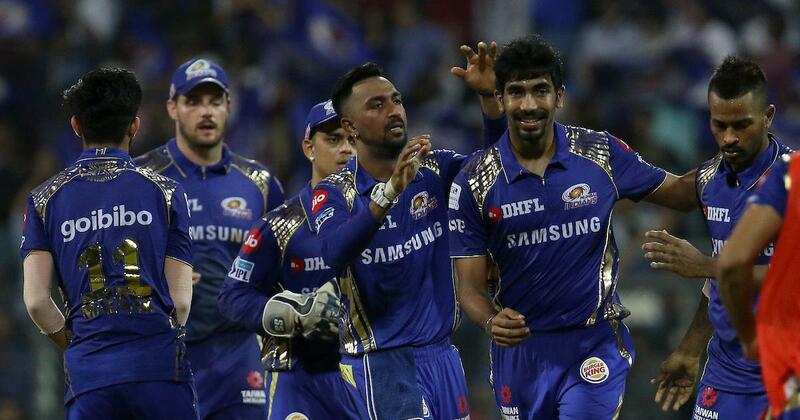 If they can get KXIP to a good start, it could spell the end of MI’s IPL campaign. Strange over from Mohit. Wides, no-balls, free hits and still just 11 runs. KXIP will believe they have a chance here. MI were 151-5 after 15 overs and they have ended up with just 186. KXIP have done brilliant in the last 5. Still MI were 71-4 at one point and they too have staged a good comeback. Tye’s brilliant spell comes to an end. 4 overs, 16 runs, 4 wickets. Take a bow. His combination of regular slower balls, knuckeballs and seam up deliveries was just too good today. Mohit gets the last over. WICKET! Another wicket for Tye. What is this guy eating? The wide knuckleball gets him Hardik’s wicket. This is big. It could mean Mumbai won’t have that big last over dash. WICKET! Ashwin stepping up today. He usually bowls in th early going but today, he has saved himself for the death overs. His carrom ball strikes again, Cutting gone. It was wide outside the off-stump but Cutting tried to slog sweep it. It only went to the fielder in the deep. Another brilliant over for KXIP and another brilliant one by Tye. He has bowled 3 overs now, conceded just 8 and taken three wickets. Last ball of the over and Stoinis decides to go with a slower ball. Pollard picks and hammers it straight back over his head for six. It is a fifty for Pollard and it has taken just 22 balls (5 fours and 3 sixes). A brave call to play him and it has paid off in style for Mumbai. WICKET! Completely against the run of play but the slower-ball bouncer just sat up and Krunal couldn’t adjust in time. The toe-end went straight to short fine leg. Easy catch. If you had forgotten what it was like to see Pollard in full flow, then this is your day. A short-arm jab for a flat, flat six was followed by a misfield by Finch which saw the ball going for four, then Rajpoot erred with his line – bowled it on the legs – and Pollard helped it on it’s way. Bad bowling, good batting. Rajpoot’s 4 overs are done, he has conceded 46 runs. Last 3 overs, 49 runs. MI storming back into this game. Now, Pollard is getting into the act too. This partnership is already worth 45 off 29 balls. Azar dropped one short and Pollard was onto it in a flash. It went deep into the stands. KXIP worried about who is going to be bowling in the last few overs. Ashwin has bowled just one over so far. A waste of talent or just bad planning? 1.6.6.4.1.1. 19 runs. Big over for Mumbai and they needed it. But it wasn’t Pollard doing the big-hitting. Instead, Krunal decided to take Stoinis to the cleaners. The first six was helped along over fine leg, the second over deep mid-wicket and then a lovely, classy drive through the off-side. Why isn’t this guy in the Indian team? Play delayed because a light tower has gone off. Once again, MI have to consolidate. They just can’t lose any more wickets. Remember, if they lose, their season is over. The longer Pollard stays in the middle, they more dangerous he will become. One lovely four through the off-side in the over off Pollard’s bat. It was MI’s first four in 30 balls. WICKET! Rohit Sharma has been undone by the short ball. He was late on it and it just looped up to Yuvraj. Easy does it. Big wicket. Good decision to bring back Rajpoot. Strange little innings by Rohit. Pollard is in next and when he has a point to prove, he can be very dangerous. Today, he has a point to prove and MI will be hoping, he puts his best foot forward. Ashwin into the attack and it’s a 5-run over.KXIP shouldn’t settle for this though. They should looked to force Rohit to do something different – he hasn’t been in the best of form. Another wicket here and they would truly be in control. Six singles from the Axar over. MI looking to consolidate. They will not want to lose another wicket for a while now. WICKET! Two in two balls. The first two wickets were knuckeballs but the one that got Surya was a good seam up delivery. It skid on Surya and he got a bottom edge, on to the body, through to the keeper. WICKET! You live by the sword, you die by it. Kishan came out on a mission but he was undone by Andrew Tye’s knuckeball. The batsman wanted to smash it down the ground but was deceived and the ball really went nowhere. KXIP guilty of bowling at least one poor delivery every over. Reminds one a bit of how Ajit Agarkar used to operate. Five good deliveries and a four ball. The fourth delivery was a poor one and Kishan pulled it for six. The left-hander charged the next and sent that for six in the area between third man and square leg. A brilliant over by Andrew Tye. Just 2 runs and a wicket. After that assault on Rajpoot it looked like MI were primed for take-off but Tye’s over came at just the right time for KXIP. WICKET! Tye into the attack and he started off with a knuckle-ball to send back Lewis. The left-hander was into the shot too early and really had no idea about this ball. This is a big wicket considering how dangerous the West Indian has been in IPL 2018. Kishan is in next. A four in the first over, a six in the second and an early four in the third over, followed by a top-edged six. Then came the shot of the match so far, Rajpoot pitched it up and Surya was onto the front foot in a flash and drove it for a six. The bowler then went short of length and Surya just guided it fine of third man. Wonderful cricket. MI are up and running. 21 runs off the over. Great over by Mohit until the fifth ball when Lewis launched him straight over his head for a six. It hit the toe-end of the bat but still cleared the boundary line. It was the first sign of MI taking the attack to the bowlers. Steady start for Mumbai. Rajpoot was mostly on target and the one four in the over came off a thick outside edge. 7.35 pm: KXIP has two changes. Yuvraj and Tiwary are back in for Mayank and Karun. MI has one change. A big one. Pollard in for Duminy. Given that MI never trusted Duminy to do anything, it makes sense. 7.30 pm: R Ashwin wins the toss and KXIP will bowl first. “Looks like there will be some dew in the second half and we wanted to take advantage of that,” said Ashwin. Rohit Sharma says MI would have done the same if they had won the toss. 7.24 pm: The average first innings total at the Wankhede during IPL 2018 is 173 and this pitch is a good one. Expect the same to happen today as well. The toss tends to be crucial as it is possible to chase down almost anything. Dew also is a factor later on. 7.20 pm: Will the pitch play a role? Don’t know about that but MI vx KXIP matches are generally close. The overall head-to-head is close. 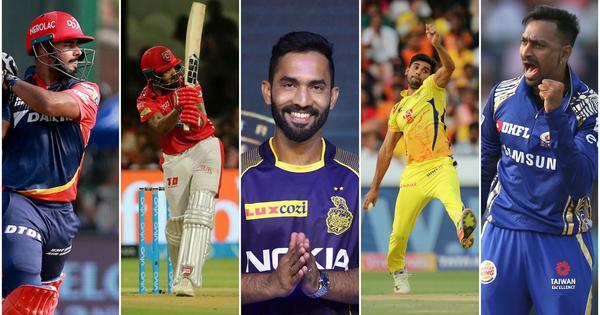 7 pm: Good evening and welcome to The Field’s live blog for match No 50 of the 11th season of the Indian Premier League between Mumbai Indians and Kings XI Punjab. Both teams will be desperate for two points, with Mumbai needing a win slightly more than Punjab. Mumbai Indians cannot afford to lose any more matches, while Kings XI could still qualify if they get beaten tonight but win their last league match on Sunday. MI and KXIP are among five teams that are still in contention for the two remaining playoff spots. KXIP are currently fifth with six wins from 12 matches, while MI are sixth with five victories from 12 games.